Founded in 2006, Villento Casino stands out as soon as you land on the site, with its shades of red and gold emulating a real Vegas-style casino. That was the apparent intention of the site, to bring the vibes of Las Vegas right into your home. Powered by Microgaming and a part of the prestigious Casino Rewards Group, you can fully expect a high quality and well run casino, and from our testing this is exactly what they have delivered. They are licensed in the Kahnawake jurisdiction and have a great line-up of casino games. If you’ve been playing online casino games for a while now, you’re probably aware that all Microgaming-powered casinos have a large variety of casino games. Villento Casino is powered by Microgaming and has over 500 of their casino games on offer. Although slots like Tomb Raider and Thunderstruck II add some established favourites to the collection of games here, there still is a huge variety of new video slots, table games as well and video poker games at your disposal. We found quite a few variants of popular table games Roulette and Blackjack were available, and we also tried out craps for the first time online here too. You are free to use these bonuses to play any casino games at Villento Casino. They also have regular promotions and bonuses that their members can benefit from. When we sign up at any casino, we like to see an efficient and good customer support team that can help us whenever we face any issues or have any questions. So, we were quite happy to interact with the customer support at Villento Casino. Not only do they have a 24/7 live chat support, but they also have toll-free phone numbers to call and an email that is specially used to address customer issues and feedback. When we contacted them, we received a quick and thorough response. 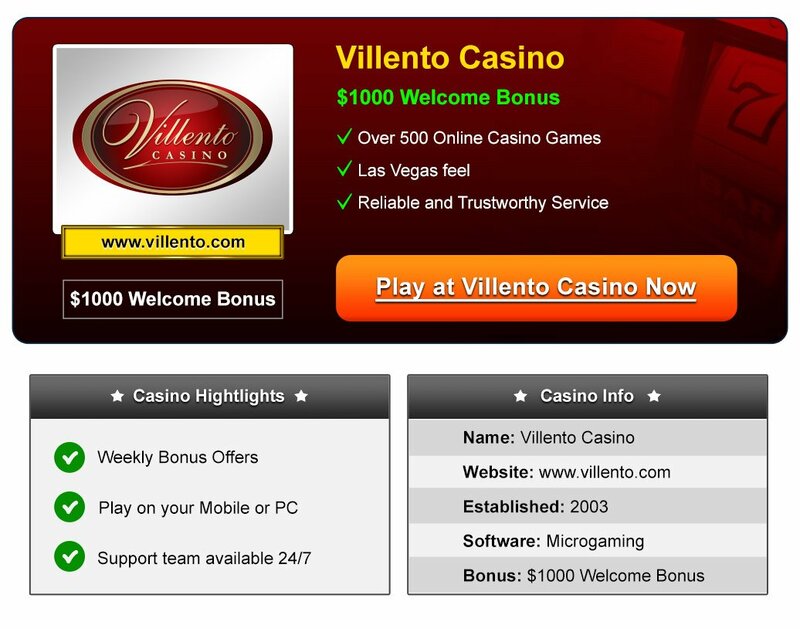 Villento Casino knows that the internet has its vulnerabilities, especially when you deal with money. Keeping customers security in mind, they have implemented 128-bit SSL encryption in to their network. This ensures that all the personal and financial details of their customers are safe and secure. With its huge gaming library, an effective customer support team, welcome bonuses and a range of ongoing promotions and offers, Villento Casino certainly deserves a thumbs up! We feel this casino is suitable for players of all levels, and is also available to play on both desktop computers and mobile devices.